This faff-free dessert from Jason Santos is not only an ideal way to end a meal, but it also contains one of your five-a-day. That means it's healthy, right? In a heavy-bottomed saucepan, mix together the sugar, cornstarch, salt and milk. Heat over a medium heat, stirring constantly to ensure it doesn't scorch. When it starts to thicken, let it boil for 1 minute. Remove from the heat. With a ladle, slowly add the hot mixture to the egg yolks a little bit at a time while stirring constantly so the eggs don't curdle. When the eggs are tempered, add them back into the saucepan. Place the mixture back on the stove and simmer for 1 more minute until the pastry cream is the desired thickness. Remove from the heat and whisk in the butter and vanilla paste. For the whipped cream, using a stand mixer, whip the heavy cream, vanilla paste and sugar until stiff peaks form. 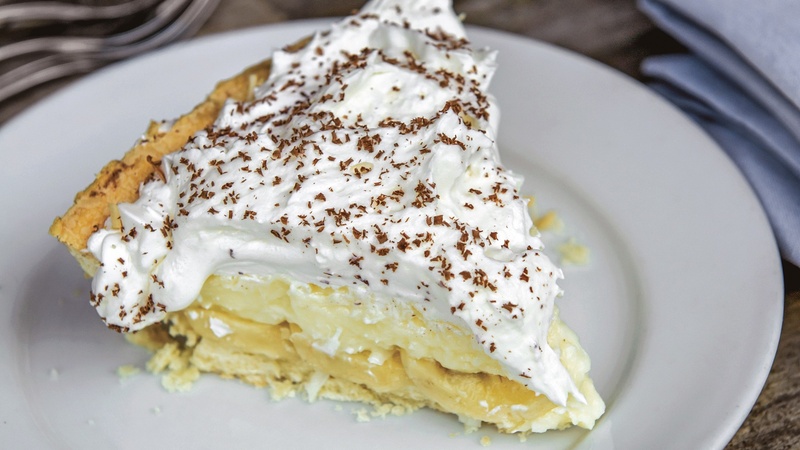 To assemble the pie, place the sliced bananas in a single layer on the bottom of the pie shell of your choice and pour the pastry cream over them. Refrigerate for one hour, then spread whipped cream over the top. Sprinkle the chocolate shavings across the top and serve. From Buttermilk & Bourbon by Jason Santos; photography by Ken Goodman. Published by Page Street Publishing Co.